As the list of serious 4×4 SUVs dwindle away, the 2014 Toyota 4Runner SR5 Premium is just what the off-road, truck-loving folks ordered. Currently in its fifth-generation, the 4Runner continues as one of the few fully capable mid-size SUVs. The redesigned 2014 4Runner receives a rugged new exterior design and interior refinements that add comfort and convenience without sacrificing its hallmark performance capability and excellent value. We drove the 4Runner enough to realize this is one tough customer! 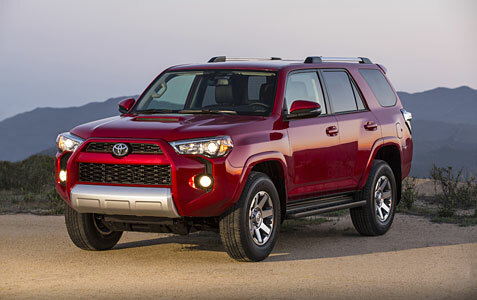 The refreshed 4Runner features a redesigned front fascia that conveys a more rugged and aggressive appearance. This includes a muscular front grille and edgier smoked headlamps for a more forceful look. The headlights have also been changed from halogen to projector beam and the redesigned rear combination lamps now feature LED lights. The SR5 as tested and Trail grades feature a color-keyed grille insert and front bumper that is surrounded by fog lamps set in sharply cut inlays that extend from the headlamps down to the bumper. In addition to the distinctive new grille, the premium Limited’s front design stands apart with a chrome-plated grille insert and chrome front bumper that extends to the fog-lamp bezels. The side molding, roof rack and rear bumper are also chrome trimmed. Both the SR5 and Trail grades ride on 17-inch alloy wheels with a new and unique wheel design to both, while the Limited continues to ride on 20-inch alloy wheels, which are now painted black prior to machining to add contrast. All grades continue to come standard with a full-size spare. The look of the 2014 Toyota 4Runner SR5 Premium is very distinctive on the road, commanding attention with the aggressive front end. There are plenty of full-size pickups that would crave the cabin space of the 4Runner with the well thought out spacing, touches of refinement and made-for-work toughness. The SR5 and Trail grades add standard Soft Touch door trim and a leather-wrapped steering wheel and leather shift knob provide a premium feel and atmosphere. The SR5 receives a new bright and highly visible Optitron instrument panel that houses speedometer, tachometer, voltage, fuel and coolant temperature gauges, plus a multi-information display that offers multiple functions. An Eco-Driving feedback system allows the driver to monitor fuel consumption in real time. On the 4Runner Trail, an overhead console within easy reach organizes the off-road control switches into one location. A compass indicator and outside temperature display add functionality. A manually controlled air conditioning system is standard on SR5 and Trail grades, while the Limited features an automatic dual-zone climate-control system.